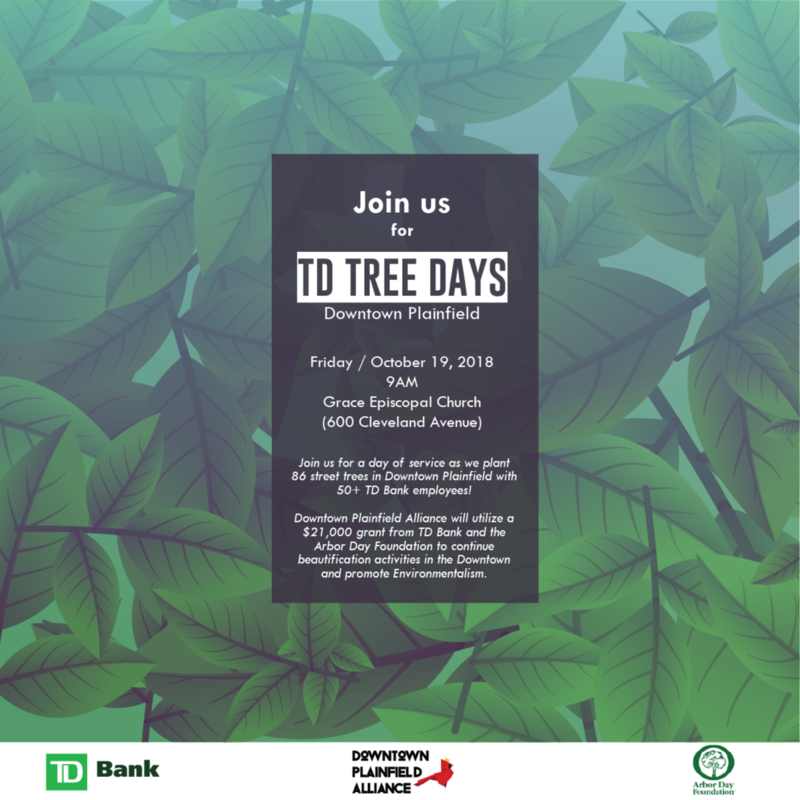 October 9, 2018 – (Plainfield, NJ) – TD Bank, America's Most Convenient Bank®, has selected Downtown Plainfield Alliance to participate in TD Tree Days, a community-based program that expands urban forests and green spaces in low- to moderate-income neighborhoods. Staff and volunteers of Downtown Plainfield Alliance will join local employees of TD Bank to plant 88 native trees in Downtown Plainfield on October 19th, 2018. "We're proud to partner with Downtown Plainfield Alliance during TD Tree Days to improve the community and elevate the quality of the environment from the ground up," said Joe Doolan, TD Bank's Head of Environmental Affairs. "TD launched The Ready Commitment to more robustly support initiatives that will ensure a sustainable and inclusive future for all. TD Tree Days is one of many programs that help promote a more vibrant planet by providing green landscapes where they are most needed. Trees do much more than beautify our communities – they produce oxygen; improve air quality and slow climate change by reducing carbon emissions, airborne pollutants and smog; provide cooling shade to reduce energy costs; and enhance the quality of life." Now in its eighth year, TD Tree Days will bring together more than 1,000 community members and TD employees in September and October to plant approximately 850 trees and shrubs in 19 communities from Maine to Florida. Founded in 2010, the program has made a significant positive impact for communities and the environment as TD's flagship volunteer and urban greening program, planting more than 300,000 native trees and shrubs, primarily in Canada and the U.S., and is managed with support from The Arbor Day Foundation. Under the Ready Commitment platform, TD pledges to plant 1 million trees in North America by 2030, and the TD Tree Days program will count toward that goal. Downtown Plainfield Alliance is one of 18 organizations in the United States that was chosen to participate in TD Tree Days through an application process. "We are excited to participate in TD Tree Days because our community will be able to replant a large portion of the many missing trees in our downtown and help us improve the environment, the aesthetics of our downtown, and help educate the community on the importance of trees, especially in urban areas,” says Ron Johnson, President and Founder of Downtown Plainfield Alliance. In addition to Plainfield, TD Tree Days events are scheduled in these communities this fall: Delray Beach, Miami and Jacksonville, Florida; Lowell, Springfield, and Worcester, Massachusetts; Auburn and So. Portland, Maine; Detroit, Michigan; Asheville, North Carolina; Atlantic City, East Orange, and Rahway, New Jersey; Easton and Philadelphia, Pennsylvania (Philadelphia in spring, 2019); Wilmington, DE, and Myrtle Beach and Travelers Rest, South Carolina. About Downtown Plainfield Alliance Downtown Plainfield Alliance is a community grassroots, nonprofit organization founded in 2016 to improve the conditions of Downtown Plainfield through marketing, beautification, and supporting the business community through events and grant opportunities within its 40-block area. Downtown Plainfield Alliance supports the vision of the City of Plainfield to create a true live, work and play destination downtown and has partnered with various downtown institutions in order to formulate the right relationships to move the downtown forward. For more information on Downtown Plainfield Alliance, visit downtownplainfield.com. Find Downtown Plainfield Alliance on Instagram at @downtownplainfieldalliance and Facebook at www.facebook.com/downtownplainfieldalliance. TD Tree Days supports TD’s longstanding commitment to community enrichment and forms one component of its newly launched The Ready Commitment, a multi-year platform that actively promotes inclusivity, economic vitality, environmental wellbeing and health, enabling people of all backgrounds to succeed in a rapidly changing world. As part of The Ready Commitment, TD targets CDN $1 billion (US $775 million) in total by 2030 towards community giving in four critical areas: Financial Security, a more Vibrant Planet, Connected Communities and Better Health. Through this platform, TD aspires to create a more inclusive tomorrow -- helping people of all backgrounds feel more confident, not just about their finances, but about their ability to achieve their goals. For information, visit td.com/thereadycommitment.